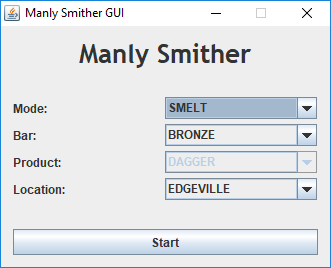 AIO Smither - Smelts All Bars - Smiths All Items. Supports common locations. Incredibly fast, utilising keyboard shortcuts where possible with the production interface. All possible methods to gain xp/make money via smithing. Smiths all possible items at an anvil. When selecting the 'OTHER' option for locations, it means that if the distance is too great between the furnace/anvil and the bank, it will be able to walk to the bank from anywhere. Nice one! Will you consider adding stamina potion support in the future? Submitted update to bring this back. Thanks for the update, script doing solid work as usual. can i get a free trail on this? Does this support blast furnace? Hi, is this currently working? Big fan of your miner.